Catholic Health Initiatives and St. Alexius Medical Center have officially signed an affiliation agreement, making St. Alexius a direct affiliate of the CHI system. The signing concludes several months of discussion and research. 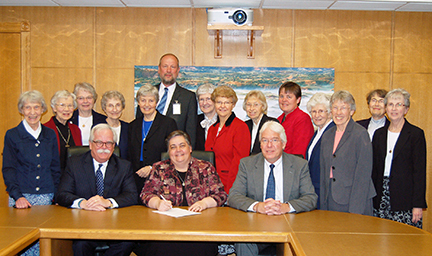 St Alexius will remain under the sponsorship of the Benedictine Sisters of Annunciation Monastery and retain a local Board of Directors. “CHI is excited to welcome St. Alexius to our system. As our presence in North Dakota grows so does our deeply held commitment to build strong relationships and healthier communities to better serve the people of North Dakota, this is a special day,” said Kevin Lofton, chief executive officer, CHI.